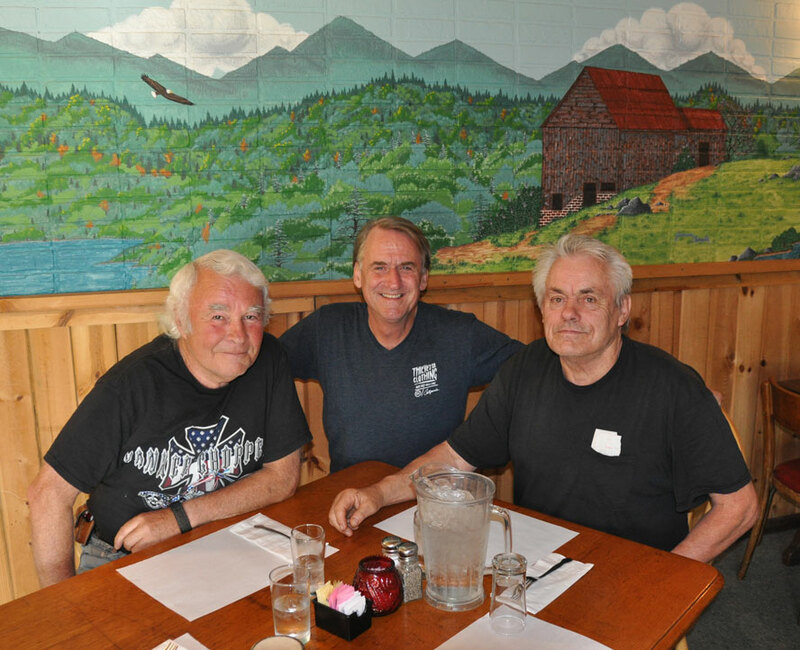 With Ron and Dennis, aging hippies and bikers, in front of the mural in the mountain bar and restaurant where we ate a great dinner. A short weekend road trip into the mountains, just one night away, became two satisfying if modest tales. The first was planned. Sort of. I’d been itching to see Ron and Dennis for a while. They both live out near Nevada City in the foothills of the Sierra Nevada, and are old friends from Edmonton, Alberta. That’s where I met them, 40 years ago. I was visiting Edmonton in the middle of winter, not the most rational place to visit in December, and they put me up and put me to work. That’s not all, but this is not about those amazing days. They both moved to the Gold Country about 35 years ago, and have been based there ever since, each in his own independent orb. Dennis has been married to Sandy for 30 years, and the two of them live close to town in the house that he built for them and her children. Ron is still a bachelor, and lives on his acreage in the woods in a van or an Airstream trailer: “the bears can’t get in that trailer,” he explains. Every so often, I pay them a visit: as you can tell, there’s always something going on with each of them. Dennis was a psychology doctoral candidate at the University of Alberta when I first met him, and had roadied for the Doors on their last US tour. 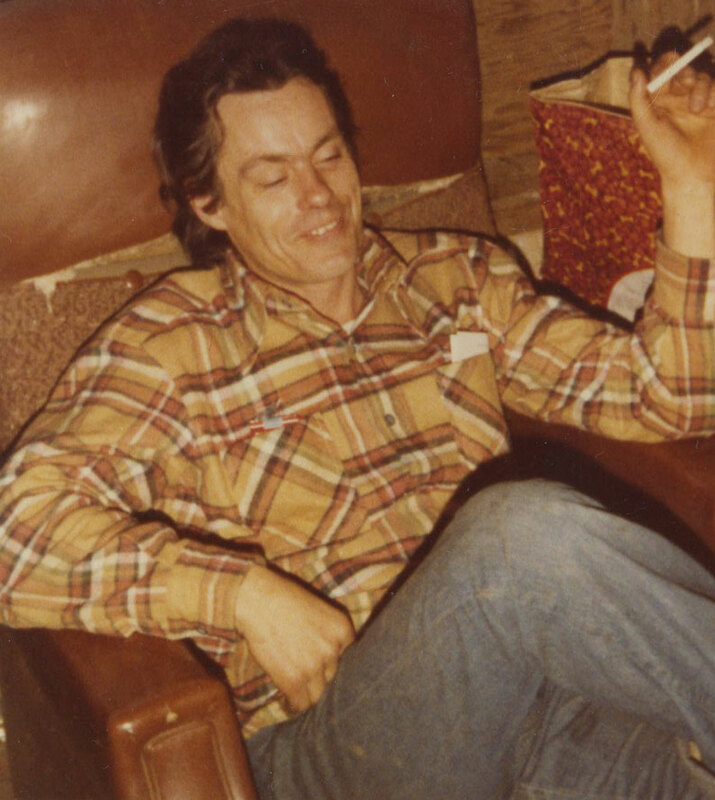 Ron was a serious hippy already in Edmonton, and had spent time traveling on their school bus with Ken Kesey and the Merry Pranksters. It had been three years since I’d seen either of them. I’m always a little careful when I go visit, because having been friends for so long and having gone through so much together (I’m more an occasional appendage than a part of this friendship), there can be an edge to things. Paul Simon’s “old friends sat on their park bench like bookends” is a lovely image, but as men age the personality traits that age with them make their friendships less sure. Frequently increasing rigidity and intolerance do not bode well, and bookends on park benches are the exception and not the rule. 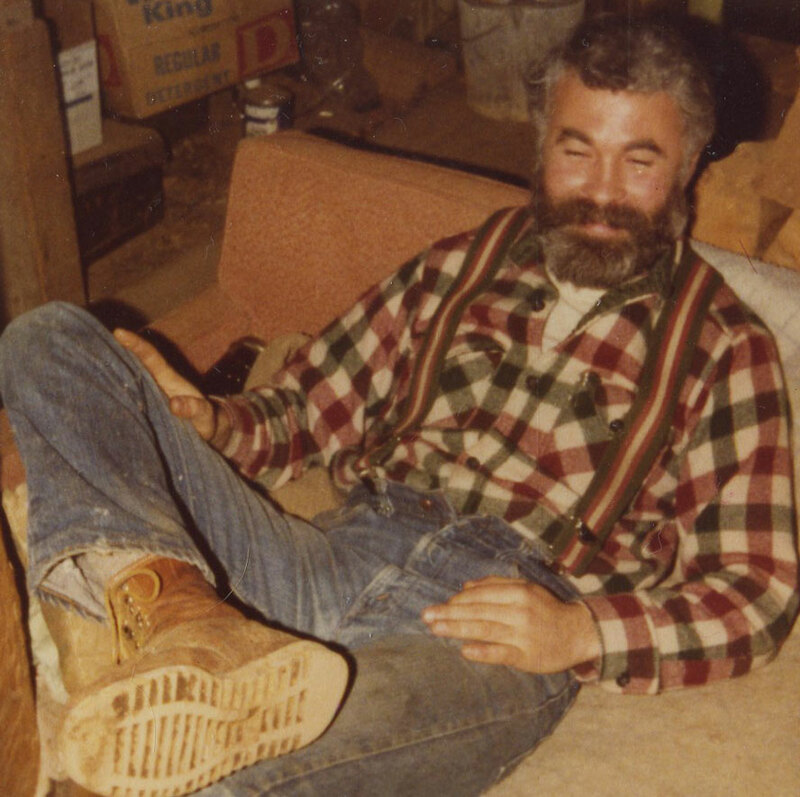 Dennis in Ron’s cabin during the same Christmas 1980 visit. This time, I showed up unannounced, first calling Dennis maybe 30 miles from his home. If he was there and available on short notice, I would invite him to accompany me to visit Ron on the other side of town. If not, I would continue on to see Ron alone. Spontaneity has the advantage of not allowing old memories or resentments to resurface in the time spent preparing for a planned meeting. Dennis was there, and available, and off we went to visit Ron. I had heard that they did not see each other much any more, but if the stars were aligned it would be nice if we all could hang out together again. Ron was not on his property when Dennis and I arrived, and we drove around looking for him for maybe 20 minutes. We found him driving out of the local store’s parking lot as we turned into it to ask the people there if they had seen him. He lives way out in the country, and that’s how you find him when he’s not home. Dinner ensued in North San Juan. It was a good thing that these guys had not had time to reflect before meeting up. As it was, the two-hour conversation included a couple of catch-your-breath-and-count-to-ten moments. During the drive up to Ron’s, Dennis had told me about the adversity he had suffered as the housing bubble burst. He had tried to catch the tail end of the bubble and, inevitably, was seriously splashed as it burst, much more seriously than any of those who had created it and made a fortune from it. 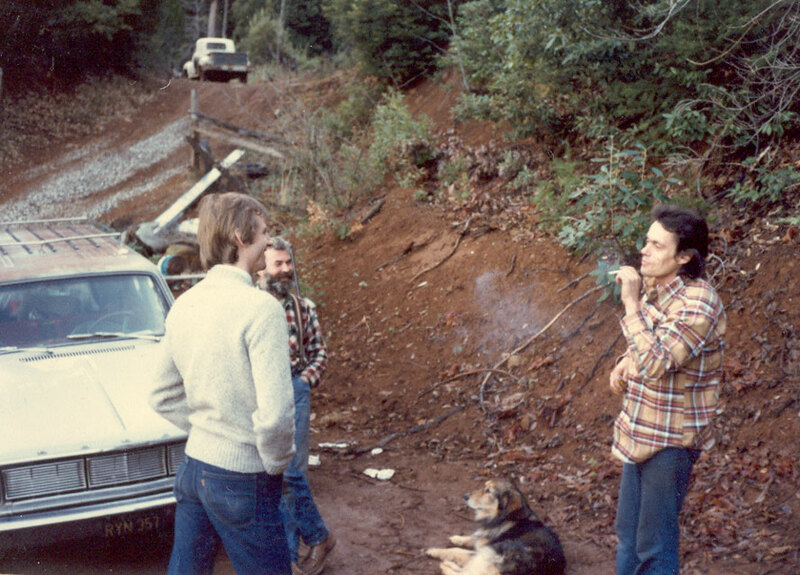 “Me and the Boys.” Meri Ann took this one, again around Christmas 1980, of the three of us on Ron’s land. He’s behind me: I’m in a grey sweater. The 1966 Dodge Dart wagon was mine, and in 1976 had made it up the Alaska Highway, and back. It turned out that Ron already knew about Dennis’s attempt to make money a bit late in the game in the housing market. Ron could have predicted, and in fact did predict, that his money had been lost. A tactful approach would have been to avoid mentioning the subject with Dennis. If Ron had wanted confirmation of his perceptions, a quick aside with me would have worked. Instead, he asked Dennis, pretty much word for word, “didn’t all that money you invested get lost?” It could be said that guys do not start life off with an excess of sensitivity: things don’t improve with age! Dennis just looked at him, before nodding agreement. “Sorry to hear that, man,” continued Ron, barreling forward, “guess everyone got burned, huh?” Dennis again nodded agreement. It occurred to me that he had been prepared for that sort of approach from his friend. Not much later in the discussion, Ron reminded Dennis that the latter had briefly dated Carol, Ron’s girlfriend in Edmonton. Dennis again deflected the direction that things were taking: “that’s the way things were back then.” True enough. “Yep,” continued Ron, “I dated Kathy too!” Kathy was Dennis’s wife in Edmonton. They lived with their baby daughter. That’s the way things were back then! “Free love and all that,” said Ron, wistfully. 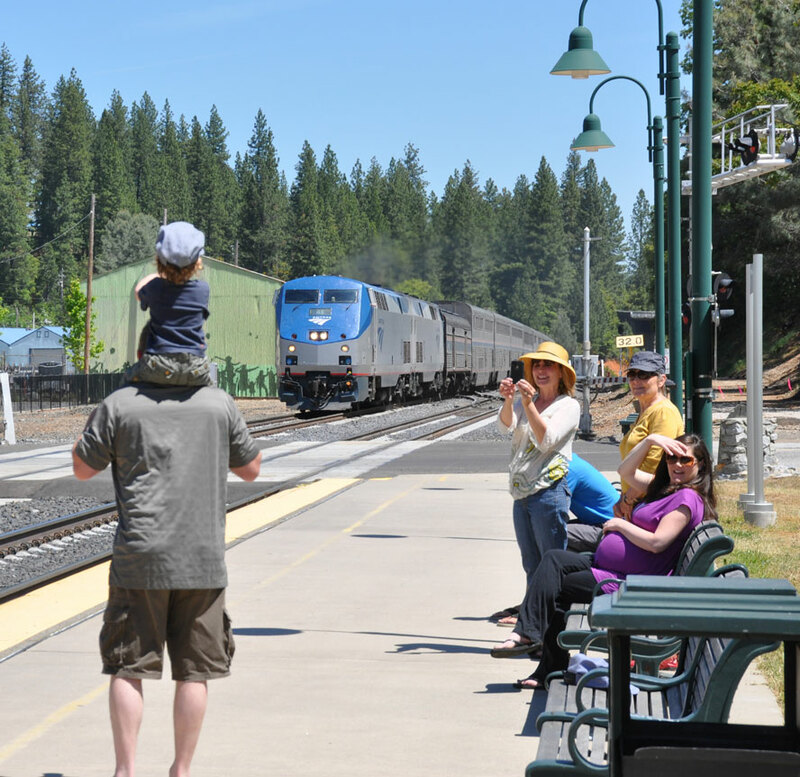 The west-bound California Zephyr arrives in Colfax on time. His mom is taking a picture of the little chap, who was waving and clapping on his father’s shoulders, really thrilled to see this train coming. That’s a feeling I know! A two-hour conversation here was just about enough! The touching moment was when Ron told Dennis, almost apologetically, that he was always afraid to see his name in the obituaries in the local paper: that’s what happens to friendship as you approach 70. We talked about doing a road trip together back to Canada. They could ride their Harleys, and I could drive my RV. First, we each need to buy that ride! I’m working on the RV. I spent the night in the National Hotel in Nevada City, which bills itself as the oldest continuously operating hotel this side of the Rocky Mountains. Based on a walk along its corridors, I believe it. “When you arrive, you’ll step back into the Victorian era,” says its web site. That is true indeed! I particularly enjoyed the group which was drinking itself silly on the balcony above my window at 2 in the morning. At about double the length of the original, their wailing rendition of “Hey Jude” was to die for! The next morning, Sunday, I decided to look for trains, one of the things I do when left to my own devices. Colfax was nearby, on the Union Pacific main line across the Sierra Nevada mountains, and there I drove. A family was waiting on the platform, the dad carrying his toddler son on his shoulders, and I asked him if any trains were expected. There were two! The west-bound California Zephyr was due in 20 minutes, and the east-bound in another 30.
Who would’ve thunk it? Discretely nestled behind a road bridge over the (no longer there) track is the west end of the disused Donner tunnel. I expressed a little surprise at the extent of his knowledge, because Amtrak trains are not known for running on time, to which he responded that he had an iPhone app. for Amtrak. Isn’t that a useful toy! The app. was confirming timely arrival of both trains. I dutifully wandered around the station and waited. I just looked at him. That sounded too good to be true. 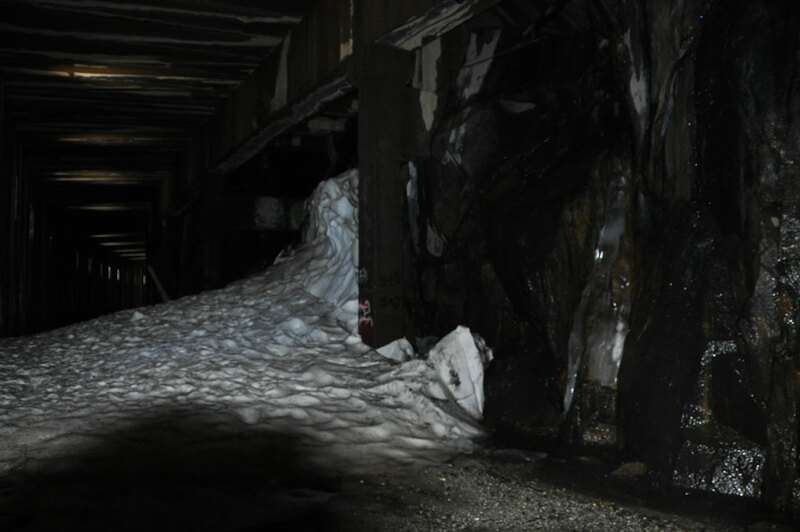 An abandoned railroad tunnel at Donner Pass: how could that be? He saw my doubts. “Yeah, the Southern Pacific closed it about 20 years ago. There are great views if you hike it.” Persuasion was seriously unnecessary. Off I drove, trying to fathom how I’d never heard of such an amazing thing. I was there within the hour. The tunnel entrance was where he said it would be, and I parked outside and walked right in. I’d driven past the opening several times over the years, and never noticed it. A snow drift in one of the avalanche sheds. Inside it was very wet. That became apparent immediately. The snow was melting outside, and almost gone everywhere except north-facing hillsides. It was still very present inside the tunnel. As it melted, dripping down the walls or from the roof itself, it had only one way to flow, along the tunnel bed. For some reason, Southern Pacific had removed the sleepers and rails, which would have given me something elevated to walk on. I ended up spending a significant amount of time searching for dry ground, and there was very little. There was also very little light. Of course: this was a tunnel! The light at the end of the tunnel was in this case the tunnel’s exit. It was small at first and very bright. I had to squint so that it didn’t blind me, avoiding looking directly at either end. A flashlight would have come in handy, but I had not figured that out during the drive up to Donner. Planning ahead can have its advantages. The fantastic stream of solid ice at the east end of the first tunnel. The Nikon couldn’t quite master this panorama, with the light in the middle so bright, the ice slightly reflecting, and the granite walls absorbing. Making my way gingerly forward, trying to keep both feet dry (and failing: I walked through a pool before realizing that the streams of water pooled in places), I was astonished to find myself at times walking on solid ice. It was 65°F outside, and there was ice inside! It was less than fully frozen, and periodically creaked with my weight on it. In roughly the middle of the first tunnel, I hit the most significant obstacle, a combination of snow drift and ice formation three or four feet high and twenty or thirty yards long, as wide as the tunnel. Where had it come from? I could see no light above, but there must have been some sort of vent somewhere that had allowed in the snow drifting outside. A view of Donner Lake I’d never seen before, from the abandoned railroad track. The track continues to the right of the photo, under more avalanche sheds. I’m going to return there soon to check how far in that direction the track is disused. There is still a Union Pacific track in considerable use (to the point where the company is considering reopening this disused track) down into Truckee, just beyond the other end of the lake. More importantly, how was I going to get past it? The question sounds silly here in the light of day, but discovering this mass of snow and ice in the middle of a dark and cold tunnel made me think twice. I could barely see what it was, and where to step and stand was very hard to discern. I didn’t want to fall through the melting ice and get stuck in it: yep, that was a real thought at the time! I seriously considered reversing course, but realized that doing so would be silly. 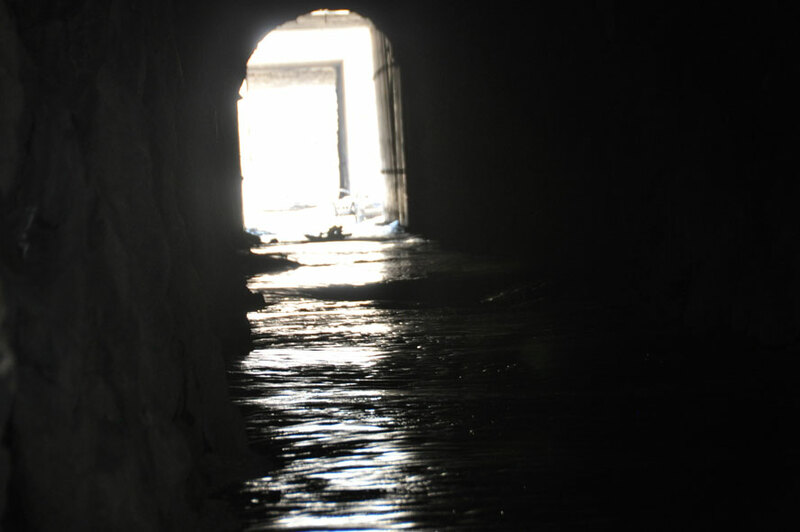 The end of that first tunnel was an amazing stream of solid ice, maybe 100 yards long. I padded my way along its edge, playing with the creaking ice underfoot, and burst out into the sunshine, into a glorious land of rock and trees. Hey, this is a fun game! 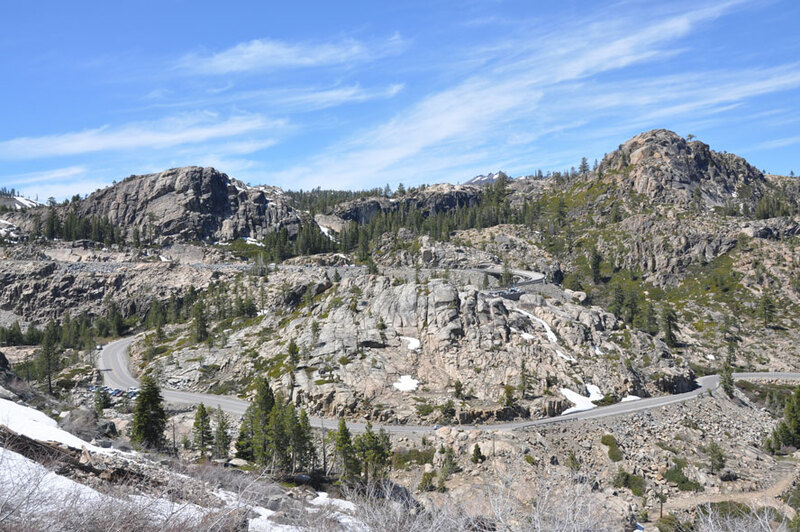 Another never before seen view, this one of Donner Pass Road, almost at the summit. Note the viaduct center right. 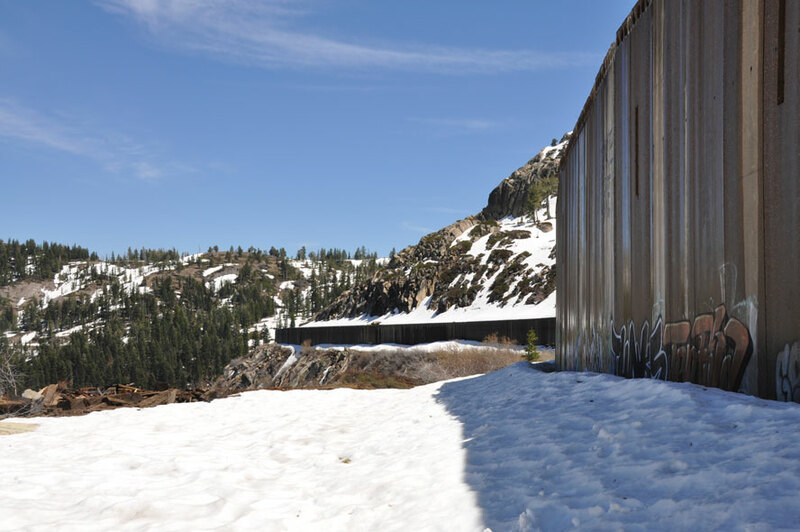 I was now on the Donner Lake side of the mountain, and began to get a sense of the continuation of these “tunnels.” I’d seen this railroad line every time I drove along Donner Pass Road, one of the most beautiful roads in the Sierra Nevada, and had never realized that it was disused. The remainder of the tunnels were avalanche sheds, as far ahead as I could see. These sheds were built by the Central Pacific early in the life of the iron roads, to try to protect them from the snow, not forgetting avalanches, as they crossed the mountain ranges between east and west. The view along one of the avalanche sheds. Still plenty of snow here, in May. I walked on through the first couple before turning back. I’ll explore the rest of the sheds another day. There was a snowdrift, this time still about eight feet high, at the entrance to the first, and another, this one still six foot deep at its edge, in the middle of the second shed. 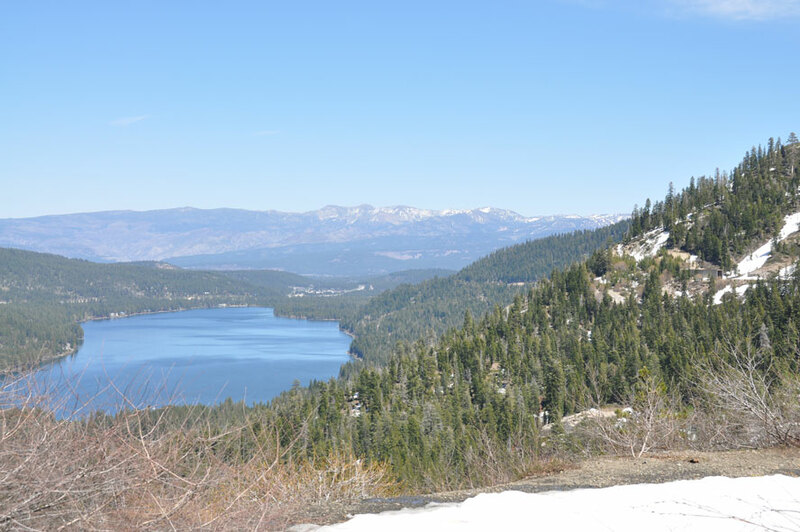 Between the sheds were incredible views of Donner Pass and Donner Lake. 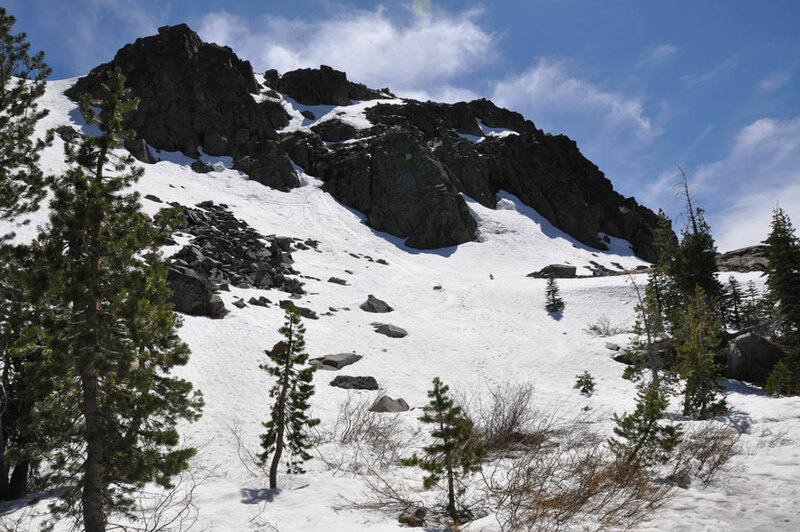 There you have it: my story of intrepid valor confronting a hard and unforgiving nature on the Donner Pass. Well, not exactly! The valor went into building the tunnel, which it turns out is not just any tunnel. To avoid navigating the tunnel’s obstacle course a second time without a flashlight, I found a trail back over the summit. Here it is, viewed from the track. 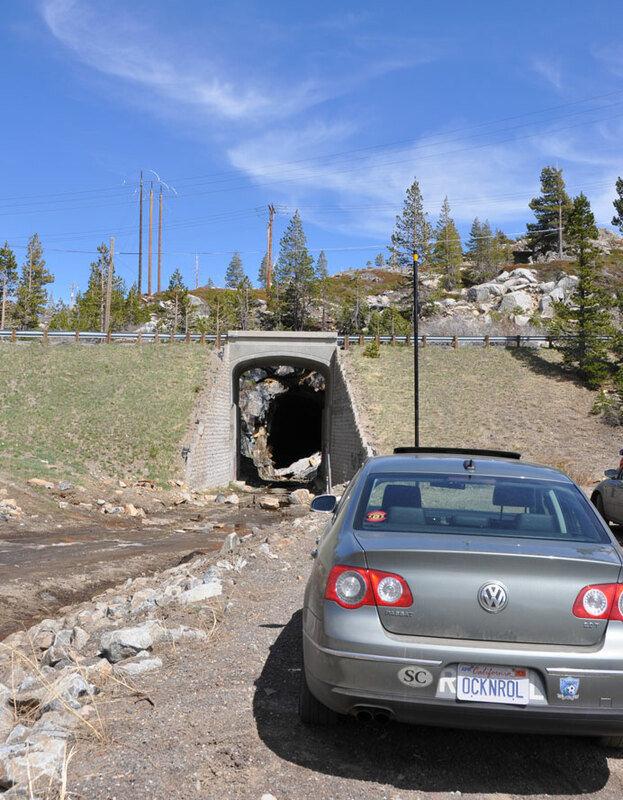 There’s a plaque on the side of the road above it announcing that it is the “Great Summit Tunnel” of the Sierra Nevada, which took “15 months of Chinese muscle and sweat to build.” This was the tunnel that carried the first transcontinental railroad in the US. It opened to passenger trains in 1868, the year that the University of California was founded in Berkeley. The next year, the line was extended to Oakland (right next to Berkeley) in one direction, and to Promontory, Utah (where the golden spike was driven linking East and West) in the other. For a Sunday afternoon stroll, I had been hiking along a little piece of history.